Sharp decline in Biotech Stocks last week was a reaction to political winds. Biotechs fear an election sweep giving control of Congress and White House to a single-party. We believe control of Congress will be retained by incumbent party or at worst split evenly. Biotech sector had a tumultuous last week, with biotech stocks of all ilk declining sharply. The sector suffered steep decline, as represented by Biotech ETFs (IBB) and (XBI), of over -6%. The decline was experienced across the board by both large-cap and mid-cap biotech stocks like Gilead (GILD), Biomarin (BMRN), Amgen (AMGN), Biogen (BIIB), Vertex (VRTX), and Bluebird (BLUE). The overall market indexes also pulled-back last week, but relatively mildly, with the S&P 500 down -1%, Nasdaq down -1.5%, and the small-cap Russell 2000 down -2%. The Biotech sector ETF, IBB, also cut through the key 200 day moving average support area as biotech stocks declined. Reassessing political outcomes, weak earnings start, and quite likely automated selling, contributed to the sharp slide in the Biotech stocks. Political winds have buffeted the biotech sector before with adverse consequences, and this time was no different. It appears the potential for a US election sweep, which can give control of the White House and both chambers of Congress to a single party, Democratic, has unnerved investors and was the primary reason for the sharp decline. Early earnings reports that were released last week also contributed to the slide. The shift in investor sentiment has occurred on the backs of polling gains accrued by the Democratic candidate, primarily as a result of growing negative reports about the Republican opponent. 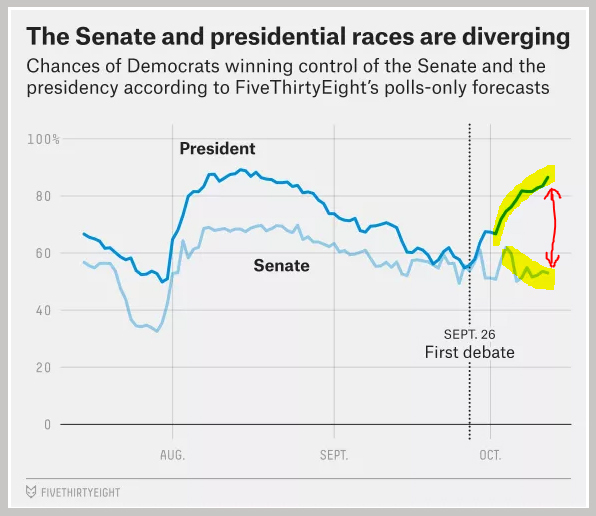 While the market has expected a Democratic Presidential victory, the surprise has been the growing divergence between the polling numbers for each candidate. This is raising the possibility, once thought highly improbable, of a potential Democratic sweep of both the Senate and the House of Representatives. The healthcare sector will prefer a split of power between the White House and Congress or a divided Congress. This will ensure a policy status quo or at least limit the extent of any policy changes relating to price regulation. Consequently, the idea of a single-party control of Congress and White House drastically undermines the market expectations, relating to Healthcare in general and Biotechnology in particular, and the reaction has been swift and sharp. "A threat to our expectation of rising stocks during October is the US election related uncertainty during the month, which will intersperse market gains with sharp volatility spurred by the fickle polling predictions of the US elections." Is One Party Control of White House and Congress Likely? Considering how vitally important the Congress control issue has now become for biotech valuations, it will be prudent to understand that the probability of a single-party control of Congress still remains low at best. Of course, the lessons from the polling pitfalls of Brexit remains fresh in investor minds, where even an unlikely possibility can become reality. As a result, in the post-Brexit era, investors have become highly sensitive to low-probability outcomes. Based on the market reaction last week, we believe investors may be overcompensating for an improbable outcome in the US Congressional elections. Looking at the data analysis from respected statistical outlets, it appears that the rising support in the Presidential election is not being manifested thus far in the downstream elections for Senators and House Representatives. Of course, there are still 3-weeks left and perhaps there is a lag before downticket support tracks the presidential support. But it doesn't seem like a resounding "Yes" at this time that the Senate is going to "flip." So if the Senate itself doesn't look like a sure "flip," the House constitution is even further away from such a "flip." Between the House and the Senate, it has always been understood that a change of control was possible in the Senate, due to a lower margin of safety, but quite improbable in the House of Representatives, where the margin-of-safety is much higher for the incumbent party, and the gerrymandering of the districts would literally require a tide of support at the top of the ticket (presidential election) to possibly change control. The high unfavorable rating of both Presidential candidates, dams the potential for a tide of support for either candidate which can sweep downstream elections. Consequently, the contention of at least the House retaining the incumbent leadership remains firmly anchored as of the present time. If the slide in the broader healthcare sector and the biotech stocks thus far in October is due to the statistically possible, but improbable, outcome of a single-party congressional control, then a pause is needed to reconsider if the market is overreacting. There is no argument that a single party control will be inimical to the financial interests of the healthcare sector, for it will have greater flexibility to push through regulations particularly on the pricing ability of the sector. 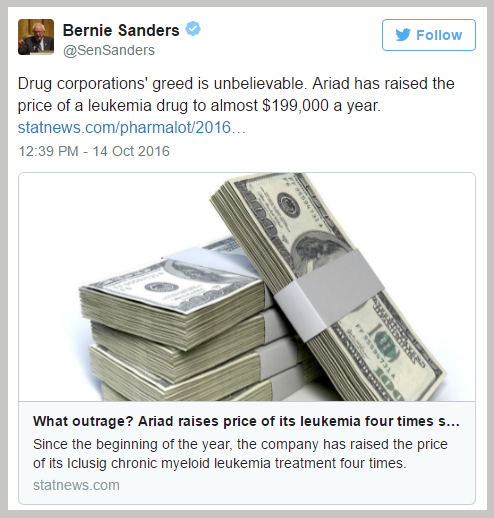 Past tweets by Hillary Clinton on pricing have sent the entire sector sliding, and more recently Bernie Sanders tweet last Friday on Ariad Pharmaceuticals sent the stock reeling, and continues to keep the pricing issue on the front-burner. Monetary policy and US election noise will now have to take a backseat as the market pivots towards an earnings season which will pick up pace this week. The season started off gradually last week, and the soft early reports also contributed to a decline. Alcoa (AA), which has always been the first major company off-the-block, missed its earnings and set a downbeat tone to the market. Illumina (ILMN) didn't help matters for the healthcare sector with a miss and a weak outlook. However, banks like JP Morgan (JPM) and Citigroup (C) indicated that the financial sector is coming out of an earnings slump. In a recent SA article, It's October, And The Market Has Not Given Up Yet, a detailed case was presented for the earnings recession for S&P 500 companies to finally come to an end after the third quarter is reported. In addition, the technology sector has been experiencing strong earnings growth which should be evidenced as bulk of the earning reports are released over the next two weeks. Some key reports this week are from Microsoft (MSFT), Intel (INTC), General Electric (GE), Goldman Sachs (GS), IBM (IBM), McDonald's (MCD), Morgan Stanley (MS), Tesla (TSLA), and Netflix (NFLX); while next week Apple (AAPL), Amazon (AMZN) and Google (GOOG) (GOOGL) will be few of the highlight earnings. We anticipate earnings to be supportive of valuations. Election Day, November 8, will provide sufficient clarity on the expected regulatory path for the healthcare sector to allow investors to adjust or reset their market expectations. In the meantime, investors have to best adapt to this expected volatility based on their portfolio objectives. A sharp decline triggered by a low-probability event also creates a buying opportunity for aggressive investors. We believe that to the extent that the healthcare and the biotechnology sector declines were caused by a recalibration of expectations around congressional control, the market did Overreact in the past week. It's also vitally important that in order for the valuations to hold and expand further, the earnings season comes in-line with expectations. We anticipate the market to steady itself over the next two weeks, supported by earnings, and arrest the downside volatility experienced since the beginning of October. We remain fully invested in our Prudent Biotech portfolio, which is up +14% for the year till October 1, compared to Biotech's IBB -14% decline, as well as in our Graycell Smallcap Portfolio, which is up +65% compared to the +10% rise for Russell 2000 index. We will recalibrate our opinion based on how the earnings season unfolds, and the guidance from our quantitative models. 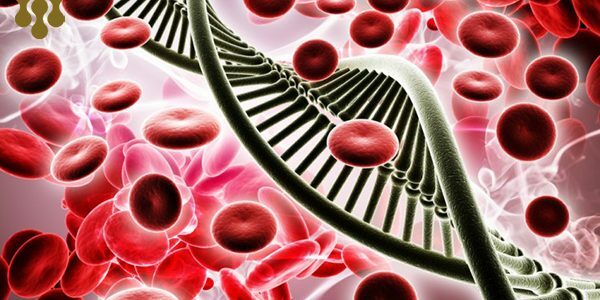 Some small-cap and mid-cap biotech names we like include Aerie (AERI), Array (ARRY), Collucid (CLCD), Corbus (CRBP), GW Pharmaceuticals (GWPH), Idexx (IDXX), Incyte , PTC Therapeutics (PTCT), Sarepta (SRPT), Seattle Genetics (SGEN) and Tesaro (TSRO). This is an opinion piece providing a reasoning to recent market events, and is focused only on investment outcomes. If you feel same or differently about the market reaction last week, or are aware of some other reasons for the decline, please do us all a favor and discuss it below in the Comment section. Kindly do note that the above analysis is neither a discussion on the need for a pricing change nor a political endorsement of any kind. So please spare the political vitriol. The Article can also be Read here on Seeking Alpha. Graycell Advisors (Prudent Biotech) is not a RIA. Past performance is not a guarantee of future results. Information here is only provided for general informational purpose and not as a recommendation, and is not guaranteed to be complete or accurate. Opinions, where expressed, can change with time and new information.